First measuring cups and spoons, medium mixing bowl, fork and tall glasses preferably clear. First add cocoa powder , vanilla and fork in medium bowl. Then add honey and yogurt and stir until they’re well combined with cocoa mixture. It will turn light brown. And now 2 tablespoons of yogurt mixture into the bottom of four clear glasses. Then top with some raspberries and repeat until all of the yogurt and raspberries are used up. 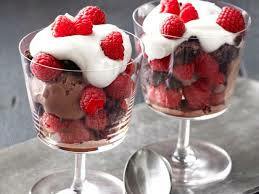 And finally serve this chocolate sweetheart parfait any bowl. Its so easy to made.